My new blog design puts Padre Pio in the pink! Beady-eyed watchers of this blog will notice I have changed the blog design. 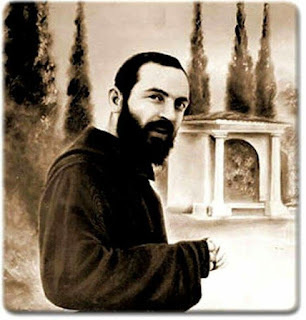 I was experimenting with themes, not having a clue as to the theme and colours I ought to use, when I said to Padre Pio that I was going to try to change the design so as to make my posts on him and the posts concerning the book on his life look more visually appealing. So, in altering the blog, I stumbled upon Blogger's Soho Theme which uses dusty pink as its default, which actually made the chocolate-brown of Pio's Franciscan habit look rather nice. I modified the pink to a crisper lavender-pink. Now, I am not the first to use this colour scheme. My close friend of many years, Frank Michael Rega has long had a vibrant pink as a background to his blog The Shield of Faith where there are riveting stories about Padre Pio and Frank uses a bright lavender for his main website which showcases his books on Padre Pio. Frank has been an amazing asset to me as I write my book on Padre Pio. You may have already identified the header photo as one taken during my time in Fatima. 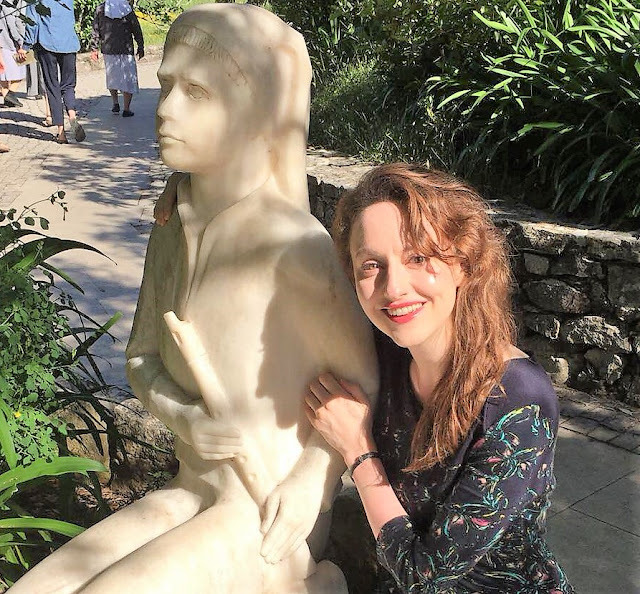 I am standing next to a marble white statue of the Guardian Angel of Portugal. You will see below another photo, taken in the scorching sun that bleached and curled my hair, of me next to a statue of Francisco who has been raised to the altars and is St Francisco. Francisco is the seer who occupies my mental space the most, in that he is in my thoughts every day and when me and my friends were in Fatima I had the feeling of being in a place where I have always 'been', putting my feet on the ground in Portugal was an act of being bodily present in a place where I have been mentally present for many years. In the new year of 2019 it will be the 100th anniversary of his death. He died two months shy of turning 11. When he was 8 years old Our Lady told him that before he could go to Heaven he would have to say, 'many Rosaries'. When I first read this, I was dumbfounded, to think that so young a child would not automatically go to Heaven. Then I thought back to my own capacity of sin and nastiness even as a very young child and I did not feel flummoxed any more. To say Francisco made good on the need to say many Rosaries is an understatement. Before his death in April 1919 he was in the habit of saying as many as ten a day. Thus we call him St Francisco.